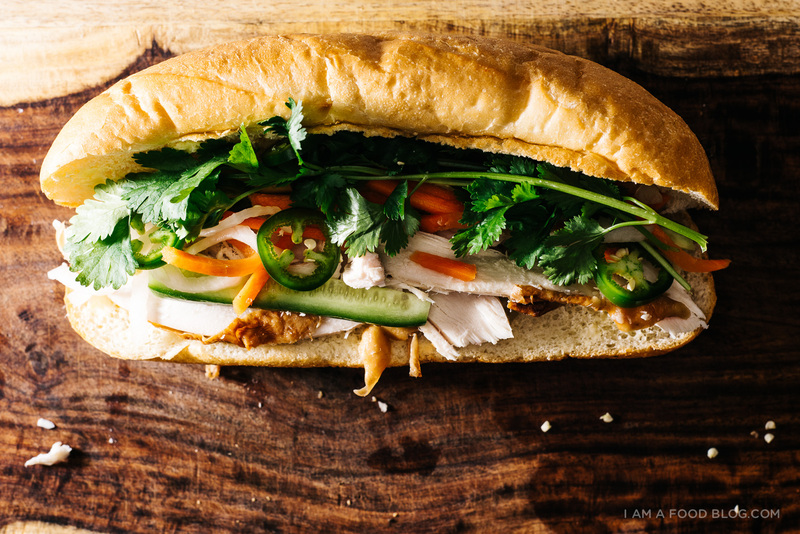 I can’t remember the first time I had a banh mi, but I do remember that once I started, I didn’t stop. Mike and I have even gone on (multiple) banh mi crawls before…in multiple cities. 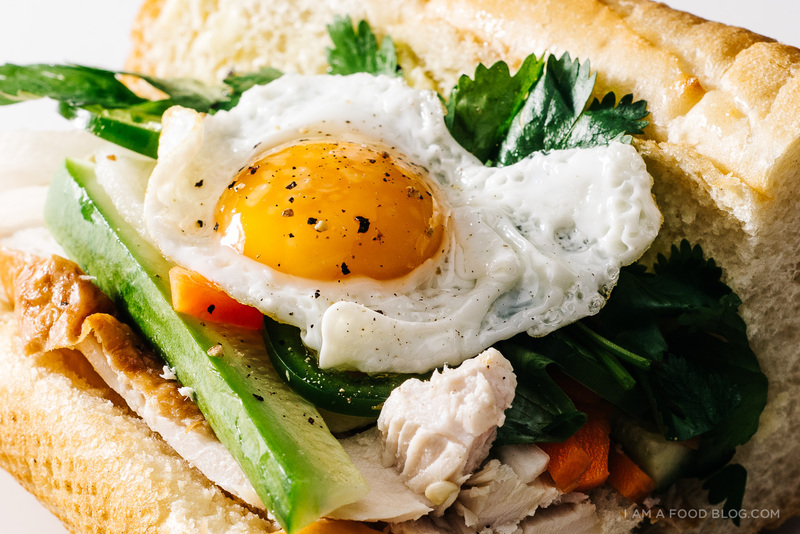 No, nothing quite as exciting as a banh mi road trip, but, if we’re in a city known for banh mi, we’ll definitely make the rounds. We’ve even found a banh mi place here in Tokyo! We haven’t tried it out yet, but it’s on our giant map of things we’d like to eat. 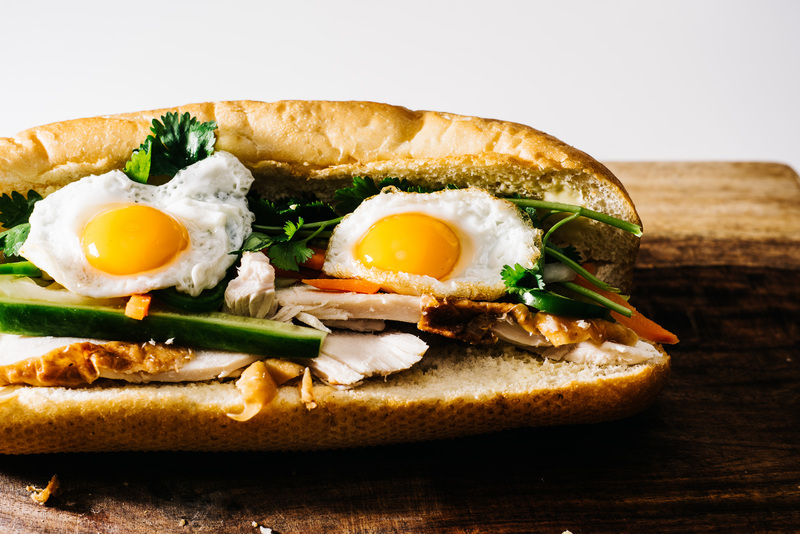 Leftovers make the best sandwiches and I can’t think of anything better than a turkey breakfast banh mi. Growing up, my leftover turkey sandwiches were pretty sad affairs (my mom’s sandwich game is not really that great – sorry mom, it’s the truth!) and now that I make my own sandwiches, they get to be pretty awesome. 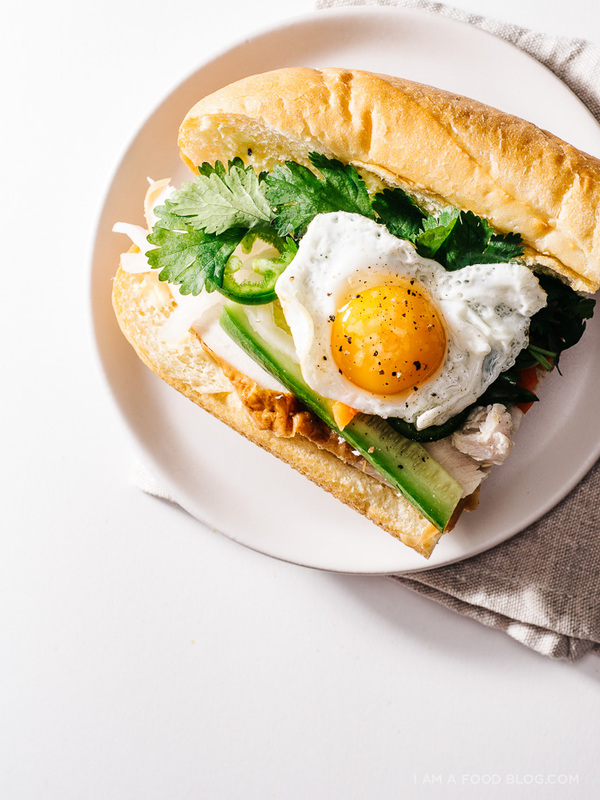 I do love traditional leftover turkey sandies with stuffing, cranberry sauce and the like, but this fresh and easy turkey banh mi topped with fried quail eggs is gunning to take over the top leftover sandwich spot. What kind of leftover sandwiches do you guys like? Make the pickles: put the carrots and daikon into a bowl and sprinkle on the salt and sugar. After 15 minutes, rinse off the pickles, drain well and place in the fridge until ready to assemble sandwiches. Slice the baguette lengthwise, but not all the way through. Lightly toast and spread a thin layer of mayo on both sides. 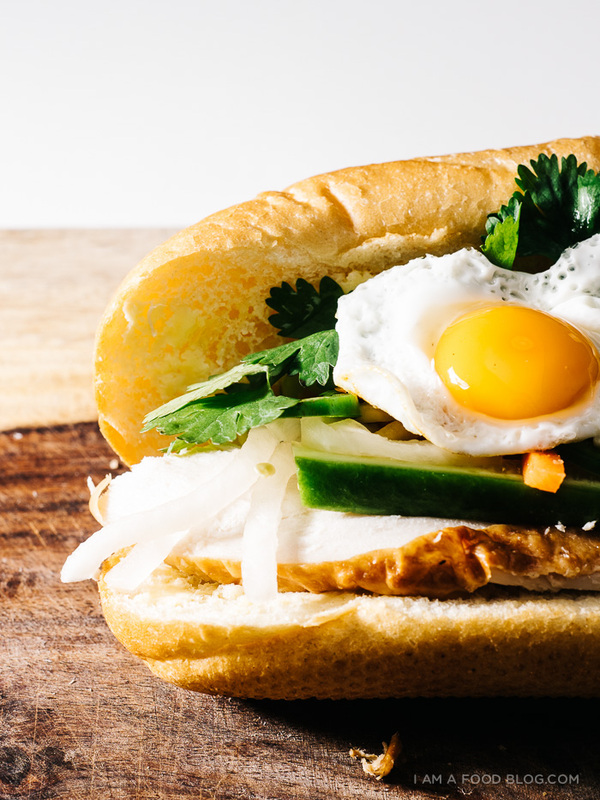 Layer on slices of turkey and top with pickled daikon and carrot, cilantro, cucumber, sliced jalapeños, and fried egg(s). Enjoy immediately! PS – Don’t forget to enter the Le Crueset giveaway! This looks awesome and the quail eggs are too cute!! For the love of brunch, this is my ideal kind of sandwich. Yum! Well this looks DELICIOUS. Perfect for sunday fundays!! Thank you for sharing!! Great mixture of thanksgiving leftover yummy! I will be trying this its like my own little subway but one hundred times better. I love sandwiches especially turkey ones. So simple yet so creative thanks for the awesome post. Perfect for the leftover turkey!! Yum!! This sounds amazing! 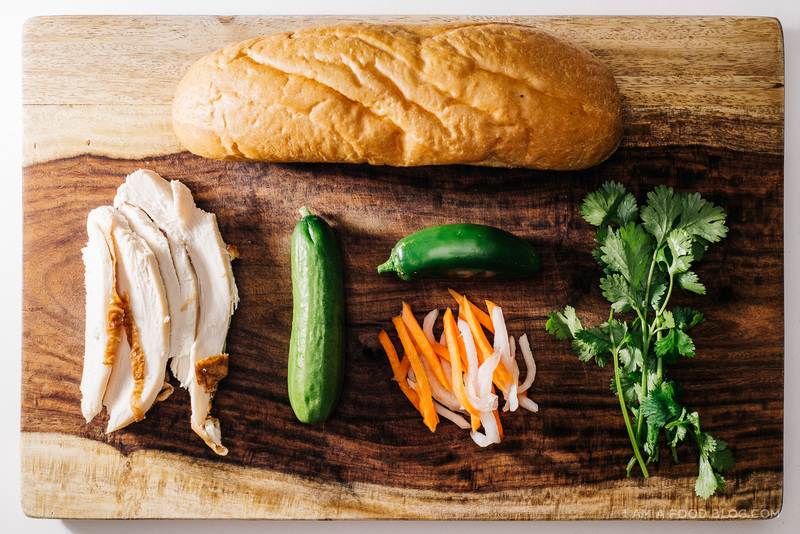 I love everything about banh mi…flavors, textures…it’s basically the perfect sandwich. Also, your quail egg game in on point! I miss living in a city where I could get banh mi. Thanks for the inspiration to try it at home! 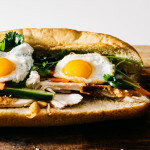 I absolutely love banh mi and will be doing my own recipe next year but the turkey and quail egg is a fantastic looking sandwich, and is definitely on my make list after Christmas (when us Brits eat our Turkey). Sadly banh mi are not terribly well known in the uk. Years ago when i was at Air Traffic College my favourite lunchtime sandwich was a pretty unique combination of bits and pieces. Sourdough roll, creamy coleslaw, grated cheddar, pineapple and cold cooked sausages (Lincolnshire works well). It was never appreciated by my colleagues but i loved it. Still do!